The Hawk 8000 controller can integrate all applications and systems within a building. This year promises to be an exciting one for the CentraLine approach to integrated building management, with the extension of existing products and the launch of new concepts. There is more information below, with even more information about them and the CentraLine portfolio on our web site: see link below. During 2016, CentraLine released information about its latest new product, the EAGLEHAWK Controller. Designed and developed specifically for HVAC applications, the EAGLEHAWK controller will radically reduce engineering and installation costs. CentraLine is now announcing two further models in the range for 2017, which are the first Niagara-based controllers to incorporate I/O onboard the controllers. These 14 and 26 point controllers are designed for controlling HVAC plant and the point count can be easily extended using the Panel bus range of I/O modules. Integration capabilities are also standard on the EAGLEHAWK controller by means of several open protocols. This allows integration with third-party products that use the supported protocols alongside CentraLine’s new room control solutions that utilise Bacnet MSTP as their communications protocol. The latest EAGLEHAWK Niagara-based controllers have I/O on board. Other key attributes of the product include the following. • PanelBus field communication protocol enabling zero engineering time for an extensive range of cost effective PanelBus I/O modules. • Utilisation of Honeywell manufactured hardware designed for the European market and which conforms to all EU installation and wiring standards. It has no need for internal batteries and uses a standard 24 V AC/DC power supply. • Designed for panel mounting, EAGLEHAWK is compact enough to be fitted into electrical distribution units, which makes it ideal for small stand-alone systems or field applications. • One engineering tool provides flexible and powerful Niagara Framework software for integration, control, metering and supervision. • Tested and proven HVAC energy-efficient application macro libraries based on years of Honeywell development and experience. The RoomUp App is the brand new Android mobile-device app for configuring CentraLine’s new range of MERLIN room controllers (see Working some magic below) covering FCU, chilled-ceiling hydronic, underfloor heating and air-quality applications. The Android mobile device communicates via a wireless IP to a BACnet adaptor that can be plugged into a controller to enable wireless configuration, commissioning and testing of any controller on that network. Available for use on Android devices using Android 5.0 or greater, the RoomUp App has all the common room-control applications pre-configured and also recognises all the functionality available within each application and the connected room control modules. Utilising a mobile app means that commissioning and configuration can be achieved without a PC on site and allows engineers to freely move around the building whilst communicating wirelessly to the controls. As each tested item ‘passes’, a commissioning report is automatically generated that can be saved as a PDF and used for validation of commissioning in O&M Manuals. Configured application templates can also be configured and passed to other engineers or used on other projects. The RoomUp Android app provides a convenient way of configuring the MERLIN range of room controllers. The RoomUp App also reduces commissioning time, labour requirements, safety risks and costs by enabling one single engineer to commission multiple controllers on the network without the need to constantly climb ladders, return to a laptop or communicate to a second engineer via a radio link. Costs are further reduced by the automatic addressing and commissioning reports functionality. CentraLine’s MERLIN is a new range of room controllers that has been designed with flexibility and simple configuration in mind. These room controllers utilise the ‘RoomUp App’ (see UPP and away information) to configure a range of applications such as FCU, chilled ceiling, radiator, underfloor and intake air. Using BACnet MSTP, these devices offer further flexibility as any free points not used by the application can be controlled or monitored by a plant or integration controller in the system. CentraLine MERLIN comes in three variants — 14, 16 and 24 I/Os. All devices can be powered with either 230 V AC or 24 V AC, making the installation flexible to the site requirements. MERLIN controllers communicate with the standard range of CentraLine wall display modules that are easily configured within the ‘RoomUp App’. 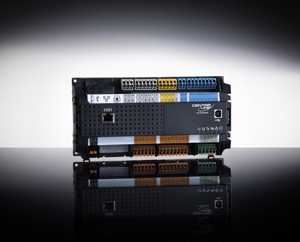 The wall modules are connected via a dedicated bus network, meaning there is no requirement to use the on-board I/O, giving greater flexibility of control options. Each MERLIN device is identified on the network via a service PIN or utilising a barcode reader within the app, enabling identification of the device’s unique serial number. Automatic assignment of the Mac address and BACnet ID for each device makes the commissioning process and identification much simpler. With the new HAWK 8000, CentraLine offers a very powerful controller for the integration of all applications and systems within a building. Based on the new CentraLine NX system platform, the HAWK 8000 not only offers simplified programming, installation and operation, but also has more processor power, more integrated data points and, last but not least, an extremely user friendly visualisation for the end-user. For this purpose, HTML 5 and Wi-Fi are standard components in the controller. With Internet connectivity and Web serving capability, the HAWK 8000 controller provides integrated control, supervision, data logging, alarming, scheduling and network management. It streams data and rich graphical displays to a standard Web browser via an Ethernet or wireless LAN, or remotely over the Internet. Finally, nothing beats a face-to-face encounter and, with so many new products launched over the last few months, CentraLine has decided to tour the country to visit customers, providing demonstrations and presentations. Look out for the CentraLine Roadshow dates in future editions of Modern Building Services or contact CentraLine directly (link below) for further information. CentraLine is delighted to once again be sponsoring the BCIA awards, which this year will take place on 11 May at the Hilton Birmingham Metropole. CentraLine will sponsor ‘Independent building controls and BEMS installer’ category, and our fellow Honeywell company, Trend Control Systems, will also be sponsoring the ‘Engineer of the year’ category. It’s all set to be another great event and will be hosted by the award winning broadcaster Steph McGovern. Hope to see you there! For more information about the event or to book tickets, simply go to second link below.